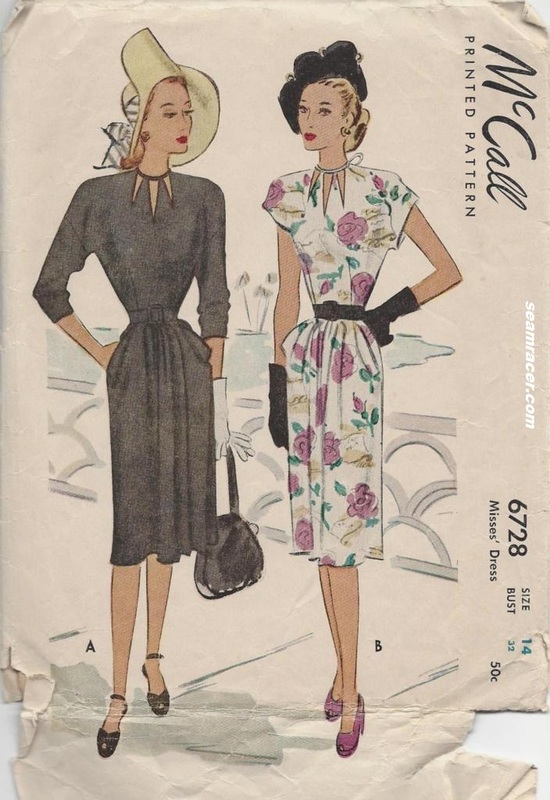 This entry was posted in 1940's and tagged "Agent Carter", "Agent Carter" television show, "McCall's pattern", "Pie-cut" neckline, 1920s theatre, 1930s theatre box office, 1940's, 1940s cut-out neckline dress, 1940s theatre box office, 1946, 1946 style ankle strap shoes, Agent Carter "Hollywood Ending", Agent Carter fashion, Agent Carter Season 2, blue, Chase and Chloe "Kimmy" pumps, cotton, cut-out neckline, dress, McCall 6728, navy, Peggy Carter dress, retro, Tivoli theatre, vintage by kellycb. Bookmark the permalink. Wow! All that tiny bias tape was worth it. I love your dress and think it might be better than your inspiration. The shoes are perfect. We’ll done. Thanks, Renee – such a lovely compliment! I’m glad to hear from others that my bias tape efforts were not in vain. And those shoes…I’m also glad to know you think they’re perfect for the dress because I was staying true to my taste and not the show by choosing them. My husband sure rolled his eyes when he saw the shoes, though! Another excuse for another pair! I was wondering how the pointy cutouts were made. Thanks! It’s a lovely dress! Thank you, Linda! Glad to clear up any ‘mystery’ the design presented! Most tricky designs are really sensible when you get to doing them…but they do make one think beforehand, right?! That tiny bias tape has me stunned- not sure I’d have it in me to deal with that! 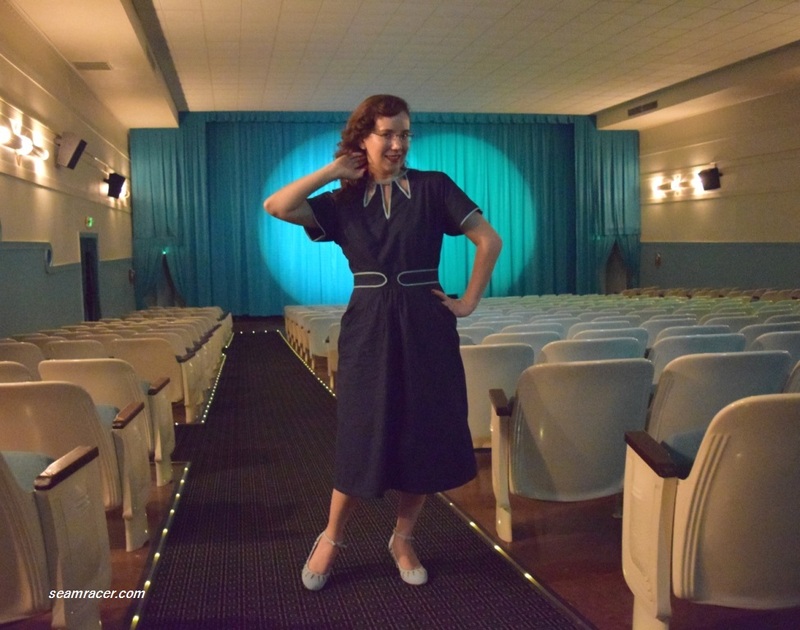 Having Agent Carter wear a 1946 dress in 1947 isn’t a problem- she’s busy, and government agents probably don’t get paid a fortune, so she wouldn’t be buying a whole new wardrobe every year. Thanks, Laurie. for your comment. Glad to hear someone realizes the trouble I put myself through for the bias tape. 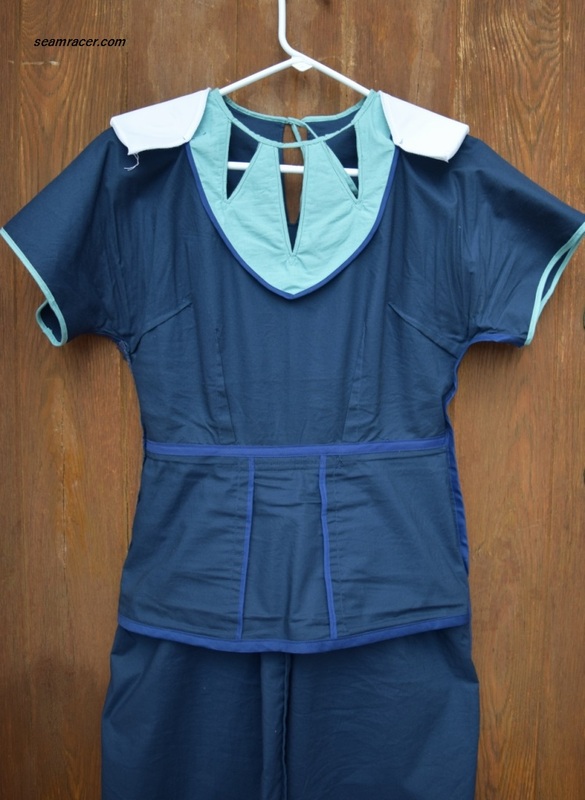 But you have the tremendous patience to do hand-stitching, whereas I don’t. Oh, the things we do for a project, right?! It’s all worth it in the end. 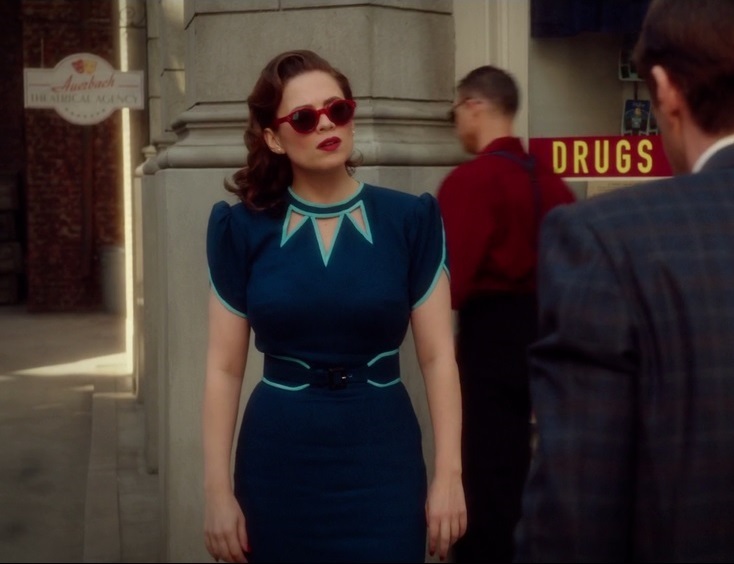 Yes, you are right about the dating of Peggy’s dresses. Her outfits were behind for her times on more than this occasion. I have to confess I was hoping you’d talk about your shoes as soon as I saw the second picture! They are gorgeous with the outfit, it almost looks like you picked out the fabric to go with the shoes! I think the bias tape was well worth the effort, the dress looks beautiful! Ah, the shoes are a cross between a lucky find on a late night internet search and a happenstance, I think. To tell you the truth they were on clearance for only $15! But yes, I was looking for light blue shoes to match even before I’d sewn the dress. Thank you for the support of my bias tape making effort! Fabric stores only offer so much and I’m not always sure what I’m getting buying on the internet – so I just make the darn stuff myself! Thank you for the compliment. Wow, 15$? That’s a bargain! Did you use a bias binding foot to apply the bias? Yeah, I love Zulily clearance items – my feet are tiny and I get the shoes cheap in a size no one wants! No, I didn’t use a bias binding foot and now that you mention it I could/should have. 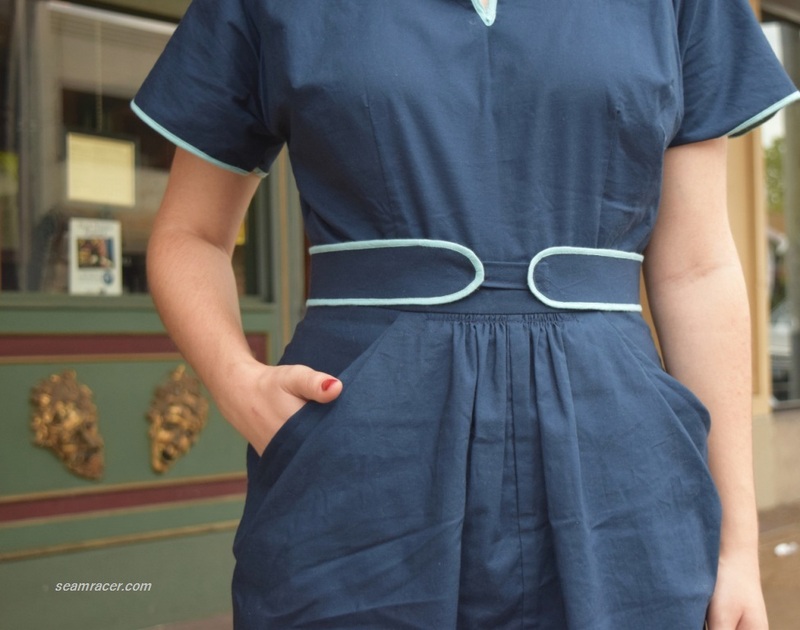 I only have specialty feet with my old vintage sewing machines and if I am not using that machine for the rest of the dress I forget I do have them. Thank you, Clemence, I’ll have to remember for next time I stitch my bias binding because using a normal foot and normal straight stitch was tough!